Great walk today, bit harder than expected, felt like it was uphill all the way, but got to the hutte in good time and the evening, as I write, is getting increasingly surreal. Left Eisenerz with no regrets. Last night was definitely the worse meal we have had in Austria, really bad. I know you shouldn't condemn a nation's food on the basis of one meal but we experienced all its worst features at once - lots of processed meat, dreadful overcooked vegetables, and salad drowned in 2 inches of water. Miserable food. directed us to the right path. Coincidentally he was also making for the Sonnschein Hutte but by another route (starting with a short bus ride, he told us). 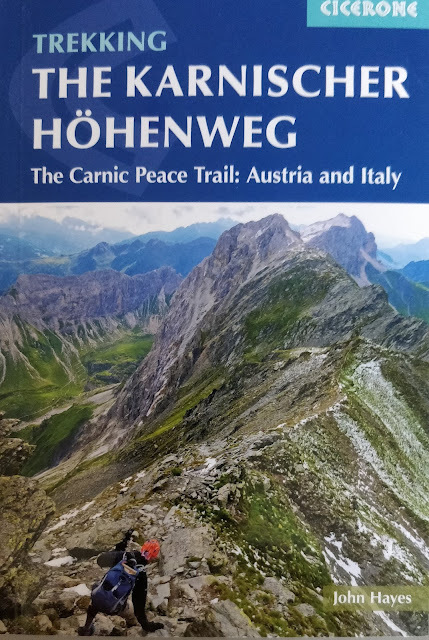 He was loaded up with a bag, a proper Austrian walker, put us on the right track, and we are exchanging views about the Austrian walking again as I write. 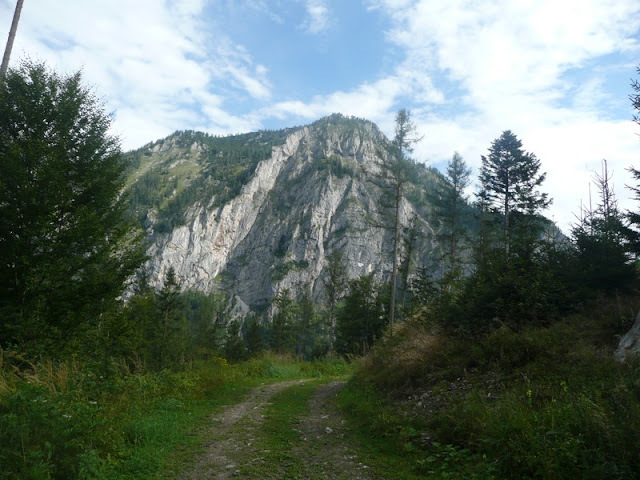 After a short climb heading north out of Eisenerz the route takes you past the Leopoldsteiner See then gently up a good track through a stunning valley with high limestone cliffs to the north and south. Gorgeous walk with a pretty stream following the path and great views up to the mountains on either side. Eventually the gentle walking finished and path head relentlessly upwards, still a good path but really steep and energy sapping. Not sure why but the climb seemed much tougher than suggested by the 700 metres ascent. The heat may have had something to do with it - by now it was red hot with the sun beating down. 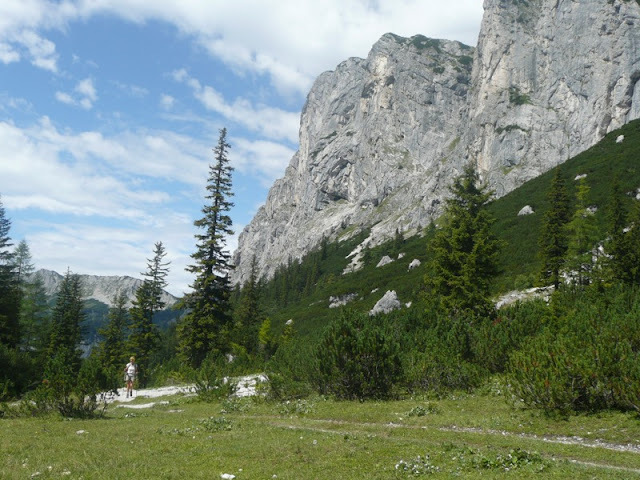 We eventually reached a high alpine meadow and stopped for lunch, the usual ham roll finished off with chocolate. 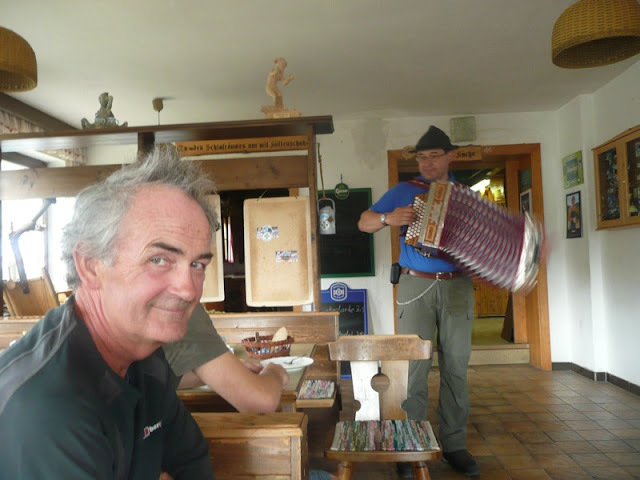 Then on, along a high alpine path up and down over limestone until we turned a corner and came across an 'alm', a wooden hut with a guy dishing out various forms of alcohol to a crowd of well satisfied local walkers, who had clearly been there for some time. The men, some with large beery bellies benefiting from long exposure to the sun, all seemed to want to give Christine a kiss, a long way to climb for such a reception. 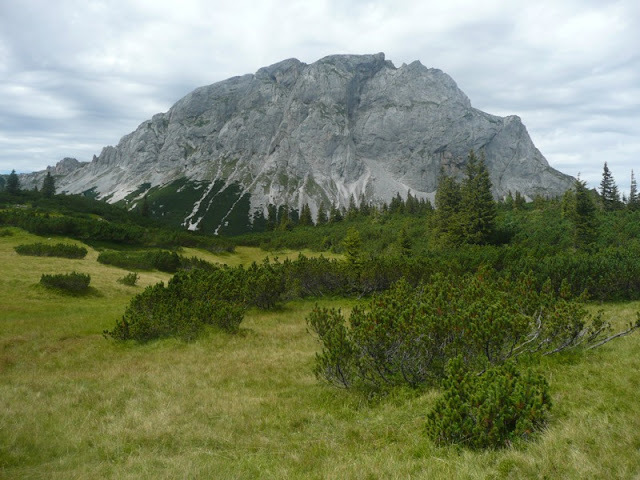 The final stage of the walk was through more alpine meadow, and for once we didn't seem to be climbing, a lovely easy walk, and by 3.30 we had arrived at the Sonnschien Hutte. Despite being a Friday night, not too many people staying here. We have the dormitory (or 'lager') to ourselves although there are another 8 or 9 people scattered about in different rooms. Included in that number is a man who clearly comes here regularly and is an expert on the harmonium. A very generous man he has copious supplies of a local resin spirit and of snuff which he insisted on sharing liberally with the inmates. We have all been sitting here for the last 3 hours quite happily chatting in broken English / German, drinking, humming along to traditional Austrian music and waiting for the very laid back hutte staff to dish up the requested potatoes and sausage. Maybe it will arrive after the next beer.